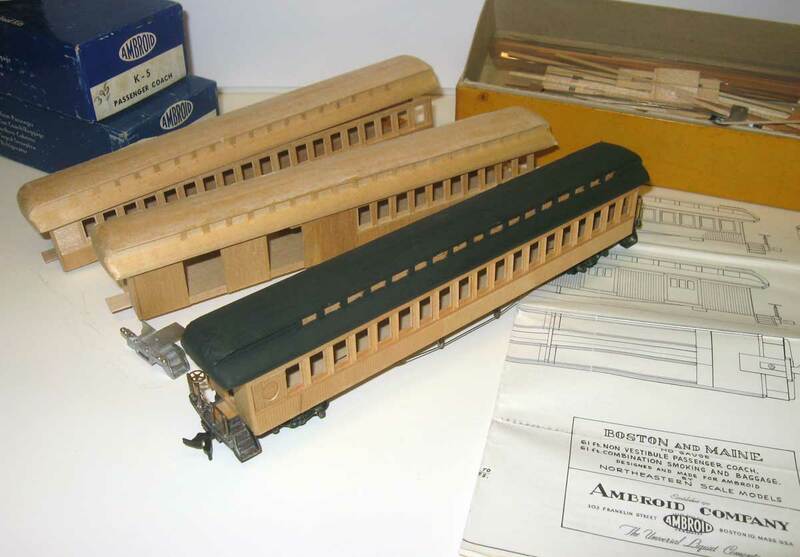 Harold Oakhill sent an update on recent passenger car projects from his workbench. We haven’t touched on passenger car models, but they were an important element of the railroads into the 1940s. Harold models the Ulster & Delaware in 1924 and passenger cars were extremely important to move people to the Catskill resorts. Here’s Harold with his update. I recently finished a project I have been working on for several months. These passenger cars are a trio of Ambroid coach kits from the 1950s that my father began building in the early 1960s. I don’t know why he never finished them, but I remember taking them out and looking at them from time to time as a kid. Mom sent them to me a few years ago (Dad has been gone ten years now) and I decided it was time to finish them. As you can see in the in-process photos, Dad had done all the work of assembling the sides and ends of two coaches and a combine, and had installed the railings on one coach. Those three cars represent a lot of fine cutting and gluing of basswood stock, and the workmanship was perfect. 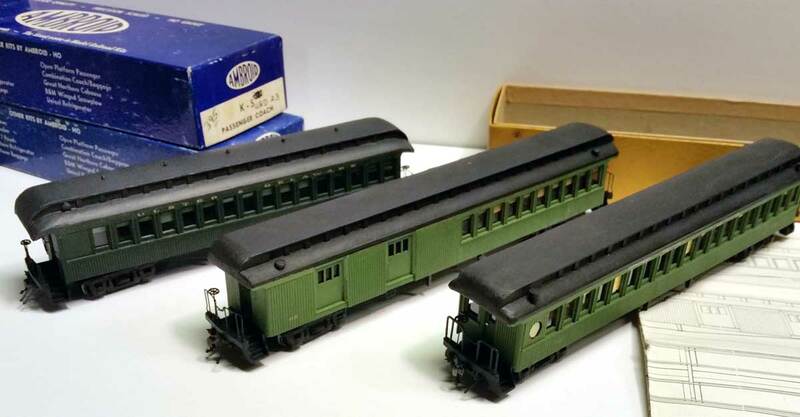 The prototype for these kits are B&M coaches from the late 19th century. At 67 feet long, these models are longer than any of the open-ended cars the U&D owned, which were in the 55-foot, 6-inch to 59-foot, 5-inch range. The combine and one coach were close to completion, so I finished them as per the instructions and lettered them for the NYC. The U&D rented equipment from the NYC in the summers to handle the rush of tourists to the Catskills, and the two railroads also operated through trains. I did some upgrades, like adding brake gear, air, signal and steam lines, and scale truss rods with turnbuckles. Dad had installed the end railings on one coach using the wire that was provided with the kit. In the days before CA and Super Glue he had soldered the railings to the cast metal platforms and had done a beautiful job. Even though the wire scales out to over 3 inches in diameter (imagine a waste pipe as a handrail! ), I choose to leave it to honor his craftsmanship. I did not add interior details, just stained the interior a dark brown, glazed the windows and added shades. MDC trucks with Reboxx wheels finished the assembly. For the third coach I decided to make some major modifications to get a closer match to what the U&D had. The two sides were coming off anyway, so it was an easy job to cut them away from the floor then cut off three window lengths and a corresponding length from the floor and roof. That shortened the car to 57′ 9″. I also modified the ends of the roof, changing it from the straight bull-nose profile common on passenger cars starting in the 1890s, to the more graceful end with compound curves coming to a point in each corner, common on cars built in the 1880s. 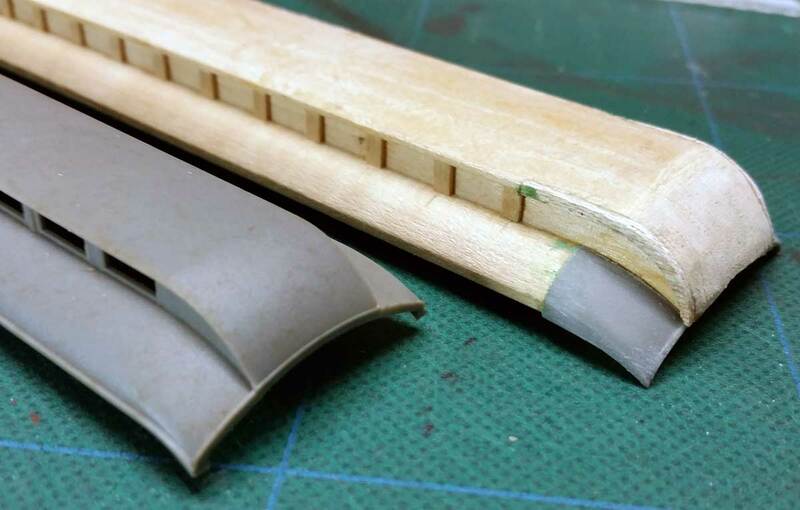 I initially thought I could use a technique used by Bernhard Schröter, but the wood roof stock that comes with the kit does not lend itself to this approach. The only plastic model with this type of roof is by Model Power, which is an otherwise wretched looking car. I grabbed a couple cheap copies from eBay with hopes that I could just swap roofs, but that roof is much narrower than the Ambroid car. My solution was to simply cut off the piece I really wanted, the drooping corner, and fit it to the wood Ambroid roof. The photos give you the idea of the work. There was a lot of fussy work in extending the fascia under the roof and cutting the signature profile into it. I used basswood and Squadron Green putty combined with a lot of fine cutting, sanding, filing, and swearing. But I am generally pleased with the results. The lead photo of this post shows the contrast between the two roof ends. For the two NYC cars, a quick look at the Internet did not provide car color info for the original paint or what they were painted by 1924. I didn’t want to use the olive drab NYC was using on their steel cars at the time, so I settled on PollyScale Coach Green. It was too yellow straight out of the bottle so I toned it down with PollyScale Pullman Green. I still don’t like it as I find the color is too bright and still too yellow. But the real kick in the head was when I applied the decals. I used a set of Champ NYC passenger car lettering in gold leaf that were plucked off of eBay. That gold against the bright green simply disappeared. Can’t see the lettering in the photos? You’re not missing anything; you can’t see the lettering in person, either! You have to get real close at the right angle to see it. In the years I’ve been researching the U&D, I’ve been unable to find the color the railroad painted their passenger cars. I knew I didn’t want that awful Coach Green, so I went to the local hobby shop. They have a full line of Tamiya paints and I grabbed every shade of dark green and olive drab they had, bottles and rattle cans, eight different colors in all. After a lot of mixing and matching, I finally settled on a can of “British Green,” #TS-9. It is a bit dark, but I’m getting used to it. At least the lettering stands out; I used MicroScale Railroad Roman Extended in deluxe gold. So there ya go; some old school, wood kit modeling. Three more kits are now out of the stash and onto the layout! On a personal level, completing these kits was a great way to “spend time with Dad” and enjoy the excellent workmanship he had put into these cars more than 50 years ago. Thank you, Harold, for sharing your passenger car modeling and a great story. Feel free to share a comment in the section below. Please follow the instructions so your comment can be posted. All comments are reviewed and approved before they appear. To subscribe to this blog, enter your info for a comment and check the last box to notify of new posts by email.